As you know, I established this Foundation on 28 October 2015, on the fiftieth anniversary of the Second Vatican Council’s Declaration Gravissimum Educationis, at the request of the Congregation for Catholic Education. By this foundation, the Church renews her commitment to Catholic education in step with the historical transformations of our time. The Foundation is in fact a response to the appeal made by the conciliar Declaration, which suggested that schools and universities cooperate so as better to face today’s challenges (cf. n. 12). This recommendation of the Council has developed over time, and can also be found in the recent Apostolic Constitution Veritatis Gaudium on Ecclesiastical Universities and Faculties, which speaks of “the urgent need for ‘networking’ between those institutions worldwide that cultivate and promote ecclesiastical studies” (Foreword, 4d) and, more broadly, among Catholic educational institutions. 1. First, it is important to “network”. Networking means uniting schools and universities for the sake of improving the work education and research, drawing upon everyone’s strong points for greater effectiveness on the intellectual and cultural levels. Networking also means uniting the various branches of knowledge, the sciences and fields of study, in order to face complex challenges with an inter-disciplinary and cross-disciplinary approach, as recommended by Veritatis Gaudium (cf. n. 4c). Networking means creating spaces for encounter and dialogue within educational institutions, and encouraging similar spaces outside our institutions, with people of other cultures, other traditions and different religions, so that a Christian humanism can consider the overall reality of humanity today. Networking also means making the school an educating community where teachers and students are brought together not only by the teaching curriculum, but also by a curriculum of life and experience that can educate the different generations to mutual sharing. This is so important so as not to lose our roots! Moreover, the challenges facing our human family today are global, in a more wide-ranging sense than is often thought. Catholic education is not limited to forming minds to a broader outlook, capable of embracing distant realities. It also recognized that mankind’s moral responsibility today does not just extend through space, but also through time, and that present choices have repercussions for future generations. 2. 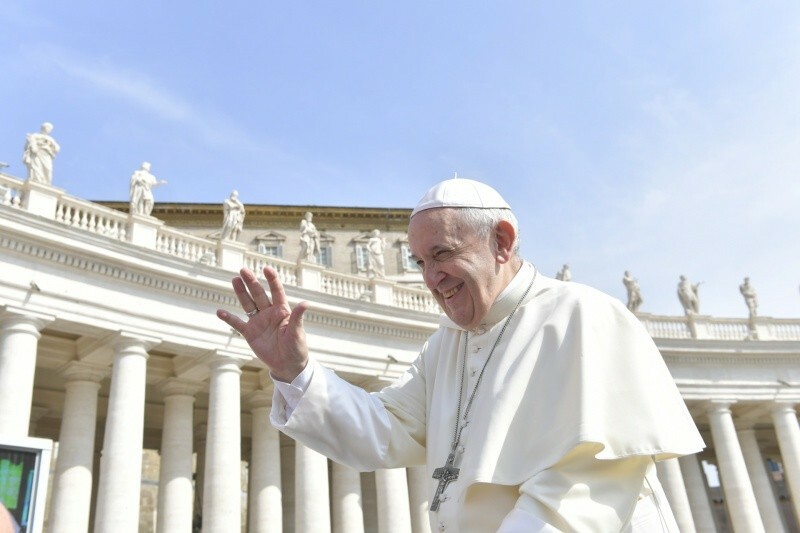 Another challenge facing education today is one that I pointed out in my Apostolic Exhortation Evangelii Gaudium: “we must not allow ourselves to be robbed of hope!” (n. 86). With this appeal, I meant to encourage the men and women of our time to face social change optimistically, so that they can immerse themselves in realty with the light that radiates from the promise of Christian salvation. We are called not to lose hope, because we must offer hope to the global world of today. “Globalizing hope” and “supporting the hopes of globalization” are basic commitments in the mission of Catholic education, as stated in the recent document of the Congregation for Catholic Education Educating to Fraternal Humanism (cf. nn. 18-19). A globalization bereft of hope or vision can easily be conditioned by economic interests, which are often far removed from a correct understanding of the common good, and which easily give rise to social tensions, economic conflicts and abuses of power. We need to give a soul to the global world through an intellectual and moral formation that can support the good things that globalization brings and correct the harmful ones. These are important goals that can be attained by the growth of scientific research carried out by universities and present, too, in the mission of the Gravissimum Educationis Foundation Quality research, which looks to a horizon rich in challenges. Some of these challenges, as I noted in my Encyclical Laudato Si’, have to do with processes of global interdependence. The latter is, on the one hand, a beneficial historical force since it marks a greater cohesion among human beings; on the other, it gives rise to injustices and brings out the close relationship between grave forms of human poverty and the ecological crises of our world. The response is to be sought in developing and researching an integral ecology. Again, I should like to emphasize the economic challenge, based on researching better models of development corresponding to a more authentic understanding of human fulfilment and capable of correcting some of the perverse mechanisms of consumption and production. Then too, there is the political challenge: the power of technology is constantly expanding. One of its effects is to spread a throw-away culture that engulfs objects and persons without distinction. It entails a vision of man as a predator and the world in which we live as a resource to be despoiled at will. First, identity. This calls for consistency and continuity with the mission of schools, universities and research centres founded, promoted or accompanied by the Church and open to all. Those values are essential for following the way marked out by Christian civilization and by the Church’s mission of evangelization. In this way, you can help to indicate what paths to take, in order to give up-to-date answers to today’s problems, with a preferential regard for those who are most needy. Another essential point is quality. This is the sure beacon that must shed light on every enterprise of study, research and education. It is necessary for achieving those “outstanding interdisciplinary centres” recommended by the Constitution Veritatis Gaudium (cf. n. 5) and which the Foundation Gravissimum Educationis aspires to support. Then too, your work cannot overlook the goal of the common good. The common good is difficult to define in our societies characterized by the coexistence of citizens, groups and peoples belonging to different cultures, traditions and faiths. We must broaden the horizons of the common good, educating everyone to understand that we belong to one human family. To fulfil your mission, therefore, you must lay its foundations in a way consistent with our Christian identity; establish means appropriate for the quality of study and research; and pursue goals in harmony with service to the common good.